Take a woman with strength and passion, add fearless ambition and dreams, mix with African pride and universal style and top off with a rhythmic hip hop flow and you get Kween G! She has held down the Australian hip hop community for over 15 years now with her consistent contributions to its music, art, fashion and community arms, lending her colourful spirit to its progression and continual growth into the Australian music industry’s mainstream. This Ugandan born, Sydney raised Queen is no stranger to struggle and knows that to get what you want in this life you have to settle for nothing less than the best of yourself. As the only daughter in a family of three boys, Kween G grew up listening to the hip hop of her brothers’ ears, with a musical diet consisting of Tupac, Biggie Smalls, Nas and Rah Digga. Thus beginning her own foray into the frays of hip hop and the cultivation of one of the illest female emcees to come out of the Australian urban community. Creating the formidable female hip hop duo KillaKweens back in 2000 with fellow femcee Belizean Bombshell, the pair dominated our local hip hop scene with their powerful performances which soon landed them on the support tour circuit. Supporting heavy hitting artists like Wu-Tang Clan, Salt N Pepa, Public Enemy and Lucky Dube to name a few, the KillaKweens also went on to establish successful recording careers and released a series of EP’s and mixtapes that garnered them a strong and loyal follow ship. Fast forwarding to latter times, Kween G has taken it back to the start of her career and is focused on more solo ventures in music, radio and community driven projects. Her work on National Broadcaster SBS radio’s Alchemy show proved hugely successful as she went on to garner a legion of loyal listeners on a weekly basis tuning in to hear her hip hop picks and new releases. With more than just emcee on her resume, Kween G has pursued the avenues of presenting and screen acting through NIDA ( National Institute of Dramatic Art ) and has gone on to win awards in the production arena for her Alchemy series “ Stolen Generation” special, in which she was awarded a Silver medal in the United Nations Category and two New York Festival Awards for Social Issues and Current Events. Kween G has also been awarded the Marrickville Council’s Young Citizen of the Year in 2010 for her continued efforts in community and youth events and regularly participates in workshops with a Non-Government Organisation “ Beyond Empathy” which uses the genres of mixed media and arts to build relationships between inter-generational disadvantaged young people across Australia. All this and a consistent presence on the hip hop stage. Her music presence is still active within the Australian hip hop scene and she remains relative to her fans and peers alike. Kween G is a powerful entity that refuses to be labelled or pigeon-holed into any typecast and uses her skill, knowledge and passion to enhance and uplift those around her. With a commitment and work ethic destined for greatness, we continue to watch with the greatest of blessings and respect the rising of a Hip Hop Kween! Hi lady, such a pleasure to finally interview you – I have been a fan and supporter of yours since your early years with the Killaqueenz and throughout your solo efforts. How has life been treating you of late? Yes Miss Hennessy I feel the same about you much respect my fellow sis, I’m happy to know that we are still here putting in work and doing our part for Hip Hop and the movement in general. Life has been treating me well, I really can’t complain every day is blessing to be able to share our gifts; we must be thankful and be happy. You have been rather quiet on the recording side of things lately focussing more on you community work and travelling around Australia meeting some truly amazing people along the way. Where are your current aspirations focussed right now, what community work are you involved in and when do we see you back on recording grind? I’ve come to know that as part of my journey I must learn from and share with the original keepers of this place we all call home. I have been fortunate to make a connection with some young original, Indigenous women and elders from Wuramungu country also known as Tennant Creek in the Northern Territory, it’s about 5 hours form Alice Springs. This is my 5th year to Tennant Creek. I spent 3 months there last year doing a project called Lady Beats which turned into a documentary that aired on NITV. I work alongside Barkly Regional Arts who have allowed me to work freely with no rules and regulations on what I produce with the ladies. Over the twelve-week training project the girls learnt how to write & record their music, created video clips and did a live performance, including a graduating piece at the Tennant Creek Desert Harmony Festival. I visited the girls again recently for two weeks and the word had gone around that I was coming and I somehow managed a group of 15 girls who recorded six new songs. I may be quiet on the surface but I’m making a lot of noise in the background. I really feel that I will always have my heart in the community but I also feel that this is my year to bring out some music that has been brewing up. For those that don’t know you how would you best describe who Kween G is, where you are from, where you are going and what you stand for? Kween G….. G is for Goddess Kween for Kibone named after my late Kuhu (Grandmother in the Bugisu dialect). I am born of the Bugisu tribe in eastern Uganda; my father carried myself and 3 of my brothers to Australia in the early 90s. I’m going back to Africa and I stand for Peace, Love, Unity, Respect, Oneness and Truth. I want the people of the sun to know and understand their full potential as the first human beings to walk this sacred earth and to be awake so they can see there is much work to be done to uplift and unify ourselves. Killaqueenz packed a mighty punch in the domestic Hip Hop arena, not only for being the powerful women you are but for tweaking Australian hip hop with your afro-centric influences. What does Hip Hop mean to you and how important is its progression in Australia’s music industry do you think? I miss rocking it as Killaqueenz; no doubt we are the perfect couple Desiree and I. This is why i won’t stop and i won’t quit, too much work has been put in! I have a line in a verse that I wrote that goes “Killaqueenz that’s the team living the dream, can’t believe they letting Africans up on the scene, not your stereo, typical, Aussie emcees”. Hip Hop for me is the outlet that I have been given to share my gift of emceeing, it’s how I chose to use it that will prove if I’m worthy of this thing we call the M.I.C. Unfortunately we live in a country that once housed “The white Australia policy” (which I believe it still does, but not in those words). One thing I do see that is very obvious is that a large portion of people who love black music in particular Hip Hop, the other thing I see is the miss use of the word Hip Hop by the mainstream, it’s become pop for all the wrong reasons. It makes me happy to see true heads who are keeping it real and I think we have to boycott all the people and songs that promote twerking, money bragging, black on black hate, female nastiness and the list goes on but I’m sure you get my drift. It’s really good to see some of our favourite underground Hip Hop artists and groups come to Australia and still get love. 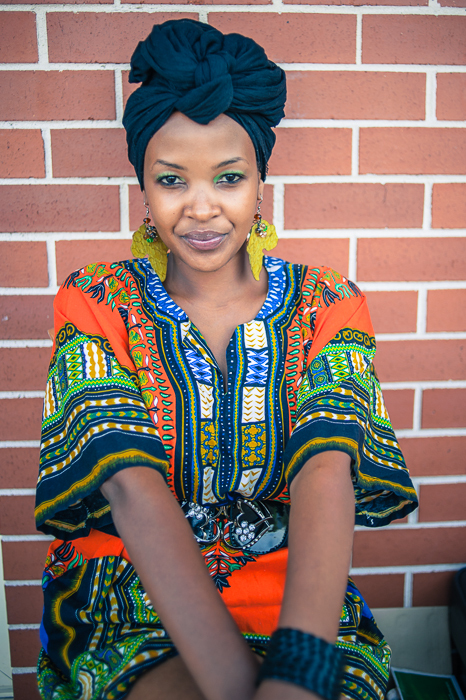 As a South African/ Australian woman myself I always pull back to unique traits of my culture for that sense of style and belonging. You are a beautiful, strong and proud woman of colour who is never afraid to wear colour. 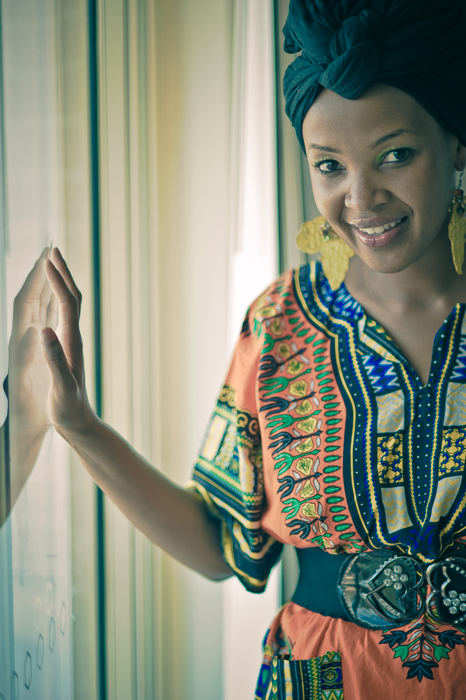 Where do you draw your personal style from and what trait or characteristic do you most align yourself with given your African culture? I don’t classify myself as a woman of colour, we are kissed by the sun and always remain the same in complexion we may come in different shades but we never change colour. I have spent the last two years waking up to the realisation that in order to be beautiful, strong and proud you must be able to look in the mirror and feel comfortable in the skin you’re in and the hair you grow. My personal style comes from the pride I take in African prints and patterns. I love promoting my ethnicity by wearing it, it’s my statement to show how creative and positive our culture is. What are you feeling or working on musically right now Kween? I’m in the midst of adding some finishing touches to what I look forward to being my album. It’s really taken me through a journey of all sorts of feelings, I actually fantasied of releasing a full length 2 years ago because i was so keen to keep the energy that Killaqueenz raised but the universe had other plans. I realised a few days ago that my journey over the last couple of years has given me a stories to tell; some are personal, educational, confronting and spiritual. I feel that I have matured so much and pleasing people is not what I’m here to do, I have always been big on sharing and experiencing together so there is something for everyone in my music. What are your goals / ambitions for 2014 and beyond? I would love to release my new material, shoot new videos, and perform more in Australia and abroad. I have been focused on promoting my music in Africa which has already proven to be a good move. One thing I truly believe is loyalty which I have for the hip hop industry here so let’s keep our fingers crossed that OUT OF EXILE is truly out in 2014! When you are not recording or travelling what do you enjoy doing for downtime? I’ll be honest I don’t really have much downtime so I’ve had to think of this answer the most from all the questions…. I love cooking but that’s not really down time is it? I find pleasure in watching educational documentaries and lectures about African and world history, the history they don’t teach us in school or library books. I have learnt the names of great scholars like Dr. John Henrik Clarke, Dr. Ivan Van Sertima, Dr. Yosef Ben Jochannan, Dr Mirimba Ani Yorungu, Dr Frances Cres Welsing, Neely Fuller Jnr, Dr Umar Johnson and the list goes on. Something you can share with us that would surprise us about you and why? If you haven’t already guessed by my posts on social media I’m a proud vegan/ uncertified nutritionist and lover of plant based living. The reason for my way of life is that I have come to realise I think, feel and look better without consuming the dead, I’m trying to look after other creatures. Your greatest motivation in life and why? I have always had this go getter mentality which I inherit from my father, growing up he was always doing things for the community while doing what he loved. So I guess being happy with myself and being thankful for what I have or don’t have, staying positive and accepting each challenge as it comes. I believe in doing what you love and putting in 100% positive energy in everything we say or do!